The Taskforce will be chaired by Alastair Dutton, who played a key role in the creation of the UK's successful offshore wind industry with roles at The Crown Estate and in government at the Department for Business, Energy and Industrial Strategy. The Taskforce will be made up of leading developers, investors and manufacturers in the sector, as well as technical experts and inter-governmental organisations. It will be supported by Henrik Stiesdal, widely known as the "father" of the modern wind industry and the creator of the first large scale offshore wind project, who will act as GWEC's Global Offshore Wind Ambassador. "Offshore wind has huge potential in many regions, as the world looks for competitive, zero carbon energy sources that can be deployed at scale and in relatively fast time frames," says Stiesdal. "However, the industry needs to find the most appropriate technologies for deploying offshore wind in different conditions - for example floating offshore wind in regions with deep water levels, and creating efficient supply chains across the globe," he adds. GWEC CEO Ben Backwell says: "Offshore wind has already become a mainstream power source in Europe, accounting for the lion's share of new power capacity in the UK and a significant share in countries such as Germany, the Netherlands, Belgium and Denmark." He adds: "Now more and more countries are starting to see the advantage of offshore wind, and the technology is in a position to become truly global." 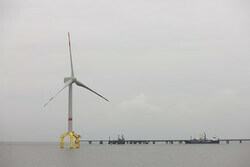 According to Bloomberg New Energy Finance (BNEF), the global offshore wind market is set to grow at a 16pc annual compound rate from 2017 to 2030, reaching a cumulative capacity of 115 GW compared to 17.6GW today. China is set to overtake the current leader the UK and lead installations by 2022, while Taiwan and the US will also reach 1GW per year of annual installations in the next decade. The Offshore Wind Taskforce initiative is being supported by some of the leading companies in the sector, including Siemens Gamesa Renewable Energy, Iberdrola, Ørsted and MHI-Vestas. Creating appropriate forums to promote the growth of the global offshore industry, including seminars, technical workshops, conferences and exhibitions.